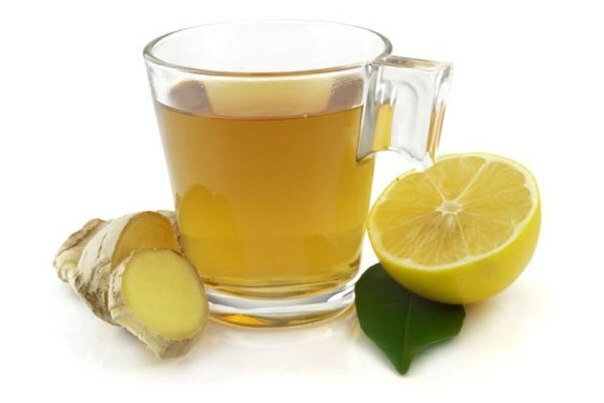 Fresh ginger tea is also very beneficial to cure low menstrual flow. To make ginger tea at home you need to follow given instructions. (i) Take some fresh ginger, wash and grate it or cut it into very thin slices. (ii) Now add these slices in about 1 cup of water and bring them to boil. (iii) Turn off the heat and put the lid on saucepan. (iv) Let it steep for 10 minutes. (v) Now strain it to remove ginger and add 1 teaspoon of fresh lemon juice. You can also add some honey or sugar to improve the taste. (vi) For best results drink this twice a day. Consumption of unripe papaya(papeeta) is very beneficial for treatment of scanty or short menstrual flow. It is also good for girls whose menses have ceased due to stress or tension. 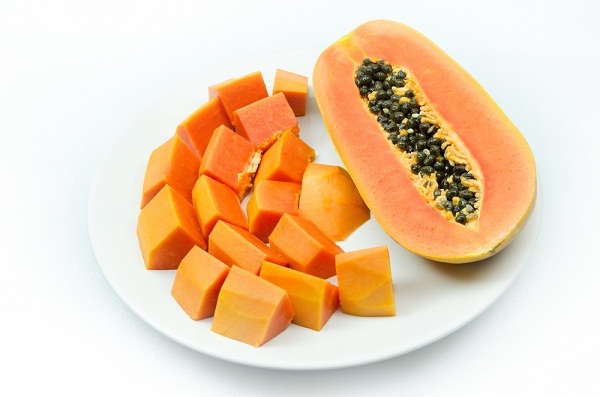 Daily consumption of about 200g of raw or unripe papaya can be helpful in the contraction of uterine walls and hence can help in securing a proper menstruation. 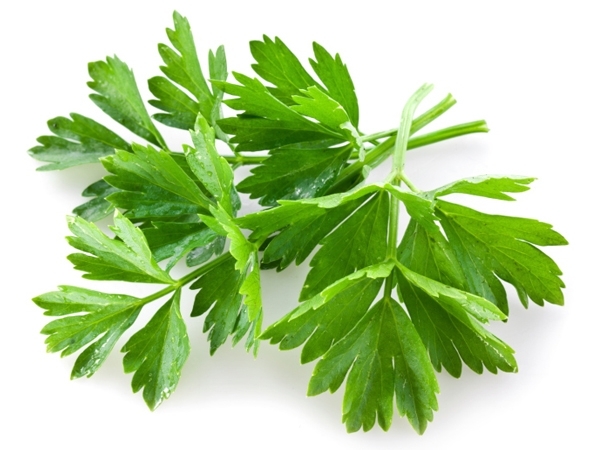 Parsley causes the uterus to contract and bring the onset of an overdue or stuck menstruation. Drinking fresh parsley juice as well as parsley tea, both are highly beneficial to treat scanty or delayed periods. To prepare parsley tea, you need to follow given instructions. (i) Just put a handful of the fresh herb in a pot of freshly boiled water. (ii) Now Cover and let steep for 20-30 minutes. (iii) Let it cool down and when it become lukewarm then strain and drink this twice a day to get rid of scanty or delayed periods. Parsley juice when taken with beet or carrot juice is also very effective home remedy for scanty periods, menstrual cramps and also assists in the regularization of the monthly periods. Take equal amounts of parsley juice and beetroot juice and mix them well to make an infusion of about 200ml. 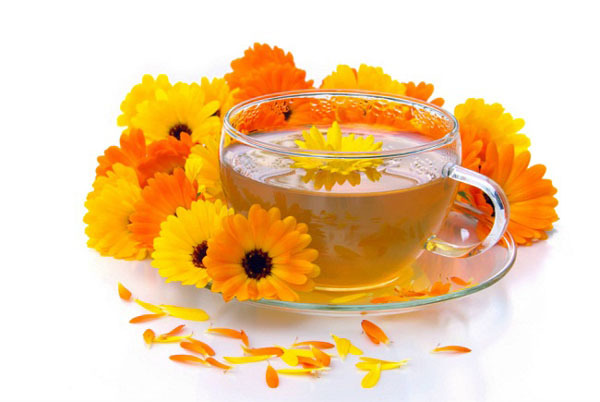 Drink this infusion on a regular basis until you get the desired results. Alternatively you can also make an other excellent infusion by taking equal amounts of parsley juice and carrot juice and drink this to get rid of scanty periods. Sesame seeds are also considered very effective to cure the problem of scanty periods. 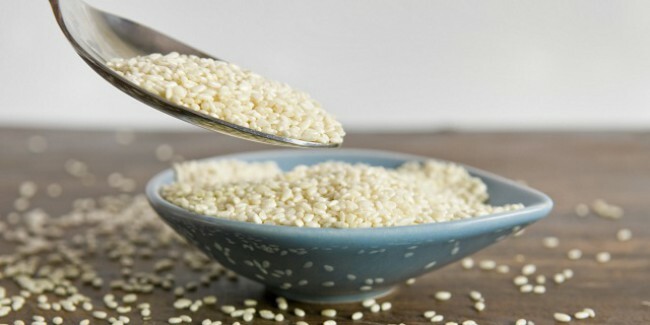 Take half teaspoon of sesame seeds with lukewarm water 2-3 times a day, starting two days before the due date of the periods. Try to consume foods rich in Omega 3 fatty acids because they play an important role in hormonal production and help a lot to cure the problem of short or scanty periods. 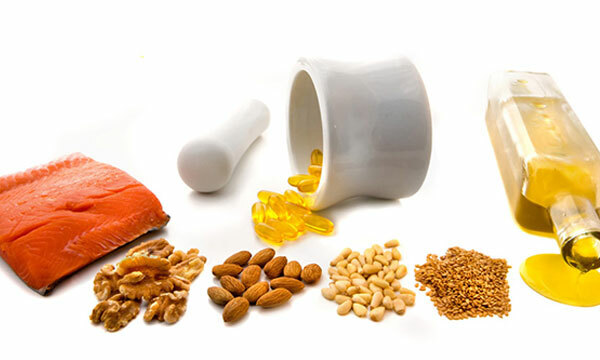 Some foods rich in Omega 3 Fatty acids are Flaxseeds, walnuts, salmon, sardines, and cod liver oil. Zinc is one of the best minerals that the body uses to keep hormone levels (like estrogen, progesterone and testosterone) levels stable throughout the entire menstrual cycle. Try to consume foods rich in Zinc. 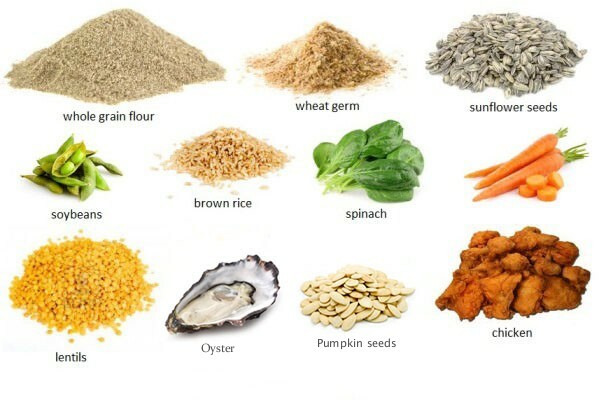 Oysters, spinach, raw pumpkin seeds, sunflower seeds and sesame seeds are best food sources of Zinc. 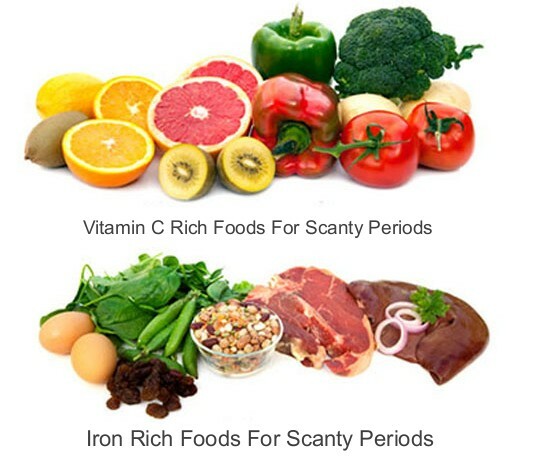 Iron Rich foods also help a lot to cure the problem of scanty periods. Read meat, Oyster, Liver, pumpkin seeds, nuts and dark green leafy vegetables are good sources of iron.To improve iron absorption in your body, don't forget to consume Vitamin C rich foods. Guava, oranges, strawberries, lemons, papayas, tomatoes and citrus fruit juices are good sources of Vitamin C.
Carrot juice is also very beneficial in getting rid of scanty periods. 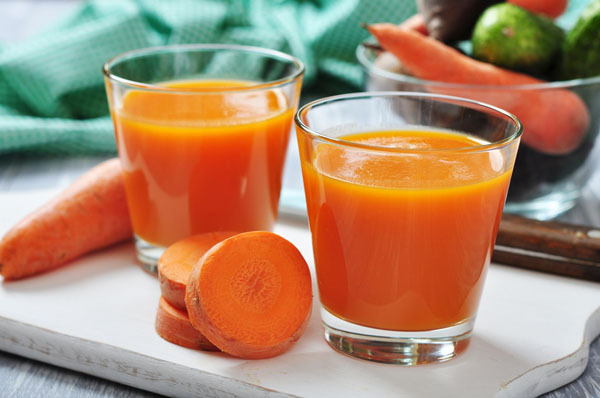 Consumption of 1 glass carrot juice on a daily basis at least for one month, has been shown excellent results in treatment of scanty periods. 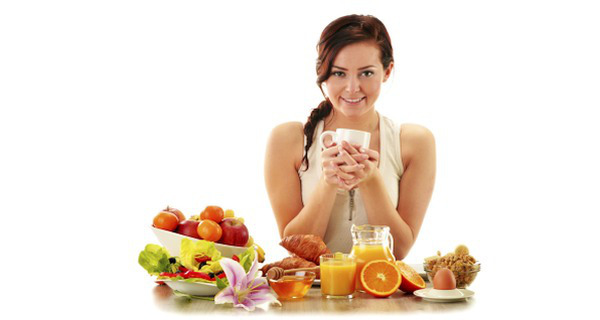 Try to consume well balanced diet rich in all essential nutrients and avoid skipping meals because when you don't get enough food your stored body fat start burning and low body fat is another cause of scanty periods.When the proportion of body fat drops beneath a certain level it affect hormonal production even may cease the production of certain hormone which are important for proper flow of menstrual blood. (i) Avoid consumption of unhealthy canned foods and increase consumption of fresh fruits and green vegetables in your daily diet plan. (ii) Try to remain stress free because stress is one of the main cause for hormonal imbalance.Stress suppress the activity of the centers in the brain that stimulate the ovaries during the ovarian cycle (to secrete hormone like estrogen and progesterone), and may result in scanty menstruation. (iii) Sometimes scanty or short periods may be a symptom of an other medical problem so first you must diagnose the exact cause for scanty periods. 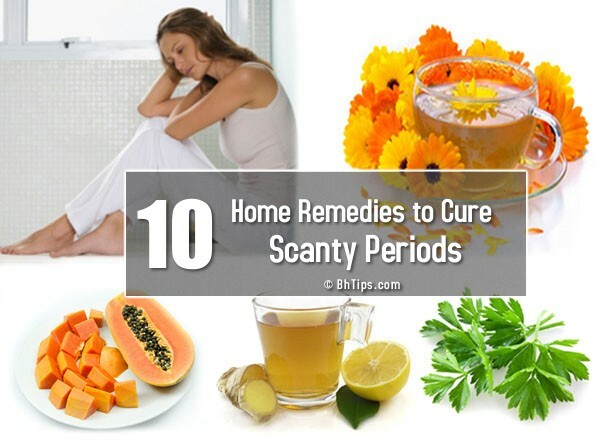 If your scanty periods are not due to some serious medical condition then you can go with above remedies to cure short or scanty periods. (iv) If you don't get cure by following above home remedies, you must consult your problem with a gynaecologist.